The All-New Old-Time Radio Show, 2006 – with podcasts! Classic comedy made up before your ears! The All-New Old-Time ‘Radio Show!’ is a totally improvised comedy show in the style of the golden age of radio, created and performed by leading improvisers from the Wellington Improvisation Troupe (WIT) (winners of the New Zealand Fringe Festival Best Comedy Award 2003). 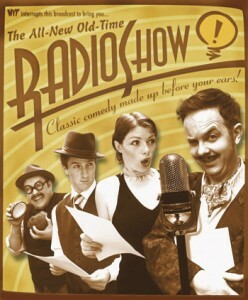 Using only the technology of the era, WIT’s radio players will take you back to a surreal summer of 1930 and a simpler time of stories, songs and standard King’s English. This kiwiana variety show will vary every evening, and be completely unscripted and based entirely on suggestions from the BATS ‘live studio’ audience. Studio supervision: Paul Sullivan, Kirsten Price. The show was the first theatre performance in Wellington captured as a podcast! Technical details: All downloadable MP3s mono encoded using LAME 3.97b encoder with “-V 8 –vbr-new” parameters (avg 40Kbps). This entry was posted in past shows and tagged improv, improvisation, Old time radio show on January 12, 2006 by MaDmin.